I seriously doubt this will be the end of my planner re-arranging for 2014, but here’s version 1! You may remember before that I was debating between A5 and personal size. In 2014, I’ve decided to finally take the plunge and give a personal a go, for a few reasons. Someone bought me a personal sized Paperchase organizer for Christmas, and I feel bad not at least TRYING to use it. As you probably know, I joined the ranks of the unemployed in December of 2013, and I worried that my DodoPad (which I’ve loved until now) might have too much space, and leave me feeling a bit depressed. I now have THREE personal sized and only two A5. I’ve never struggled to find use for the A5s, but three personals sitting in a drawer unused seems obscene…. Making the adjustment to smaller pages may be easier now when I have less going on than when I have a busy schedule, so I thought I’d try it now, when it has a good chance of success: a sort of now-or-never moment! 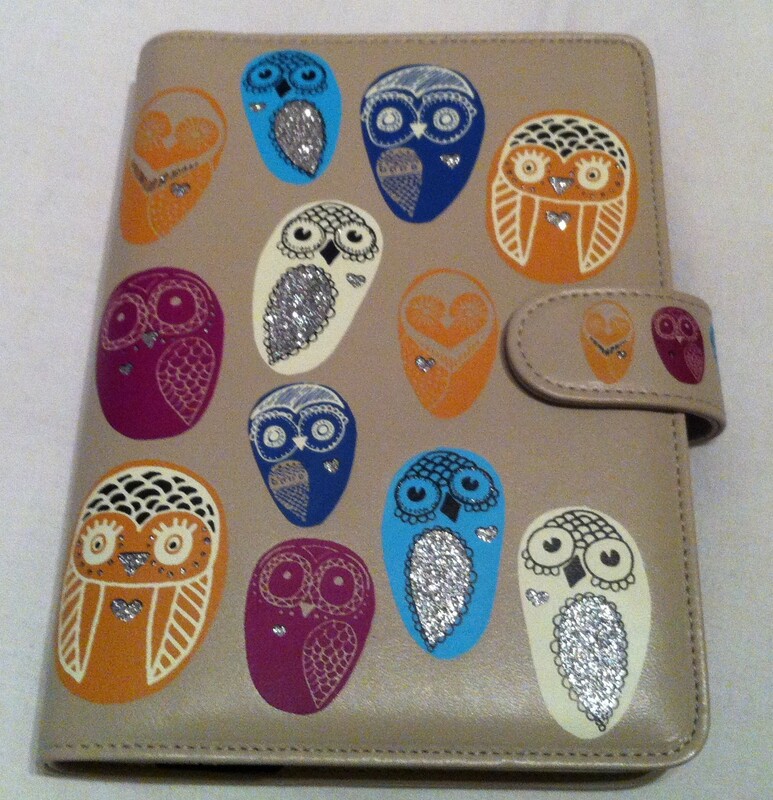 So, for 2014, I will be using a personal sized, non-filofax organizer – for now at least! After a month of use, and a little bit of tweaking here and there, I’ve got my set-up ready to show you. So, here’s my new organizer, in all its glittery, eccentric and possibly a tiny bit creepy, glory. I’ve got six tabs and three top tabs set up at the moment. My first tab is called (imaginatively) Year and it’s for long term planning. 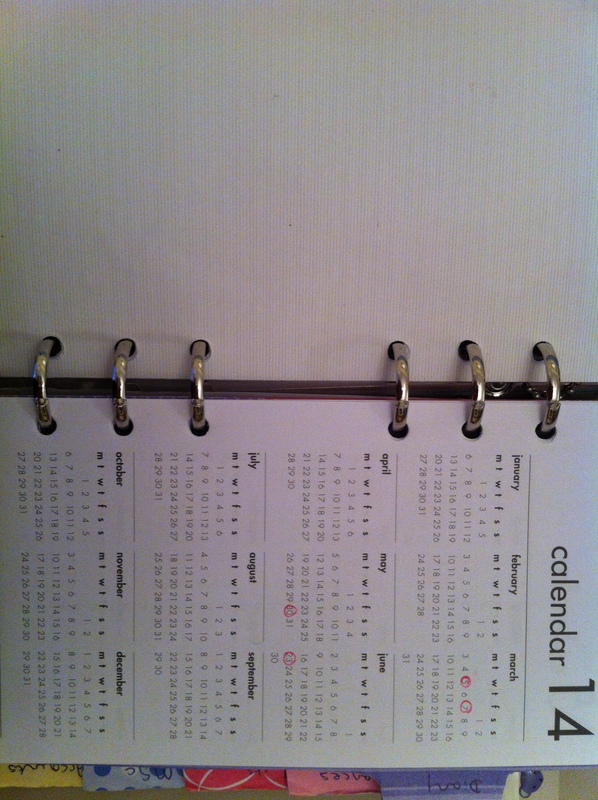 First up, it has a year to view – so far, as you can see, all I’ve done is circle a few birthdays! 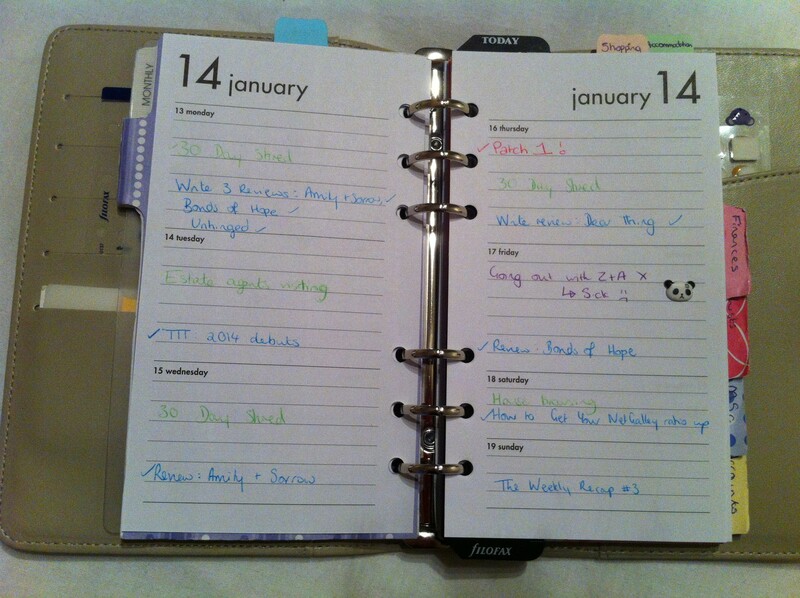 Then it has my year planner, which is (at the moment at least) pretty much exclusively for planning visits to my other half at uni. Then I have a top tab for the months – after this I have two months to a page, and I’m planning to use them for details of birthdays, important events and recording snake feeds/sheds etc. My second tab is for my diary. The organizer came pre-loaded with a 2014 diary, which I’m going to stick with for now. It’s a pretty standard week on two pages, with smaller sections for Saturday and Sunday (which I don’t like) and lined (which I LOVE). I don’t love the format, but I don’t hate it either, and it seems silly to buy a replacement diary without at least trying this one out, especially when I don’t even know if I can get on with the personal size! If I stick with the personal size, I may switch to the Week per page with notes later on in the year. My third tab is for my finances, tracking my spending etc. Now that I’m jobless and trying to save for my Masters, I really need to spend less, and I’m hoping by recording it I’ll stop unconsciously wasting money. My fifth tab is for my MSc course. It has a list of relevant text books I need to try and get and open access journals for if I want to do some background reading. I’ve then got a top tab for accommodation, because I’m still comparing different halls etc and frequently want to compare the specs and prices/compare that to the costs and time of commuting. My final tab is called Accounts and it has usernames and passwords (in code). I have to admit, I do miss the A5 but the personal is much more convenient for travelling around. Although I’m mostly just at home right now, when I go to visit my other half (for up to a week at a time) the personal is much easier to squeeze into a bag! I’m going to keep trying with the personal, and I’m thinking of setting up one of my A5s as a blog planner to use alongside it. If you have a blog planner, I’d love to see the set-up, or get some tips for setting my A5 up!